New housing prices were unchanged on a national basis for a third month in a row. In October, new home buyers in 16 of the 27 census metropolitan areas (CMAs) surveyed saw flat or lower prices. Prices at the national level have remained largely unchanged since November 2017. New home buyers in Toronto saw prices fall 0.1% in October, while prices were flat in Vancouver. 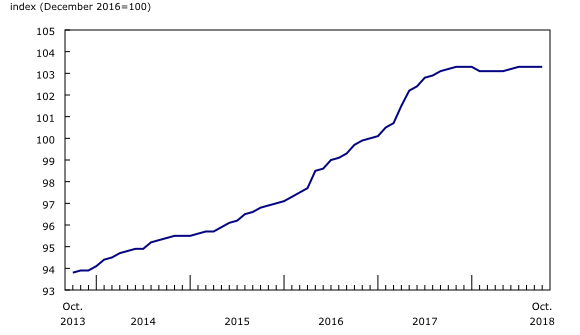 Tighter mortgage regulations as well as provincial interventions, mostly targeting the Toronto and Vancouver housing markets, have likely contributed to the slowdown in new home prices in these historically expensive CMAs. The pace of new home construction has also slowed in both CMAs. According to the Canada Mortgage and Housing Corporation, single-family housing starts were down year to date in October, compared with the same period in 2017 in both Toronto (-40.3%) and Vancouver (-11.9%). Single-family homes include row, single and semi-detached houses. The largest price increases in October were in Windsor (+0.9%) and Ottawa (+0.6%). Builders in Windsor reported that a shortage of developed land, as well as higher construction costs, contributed to the price increase. 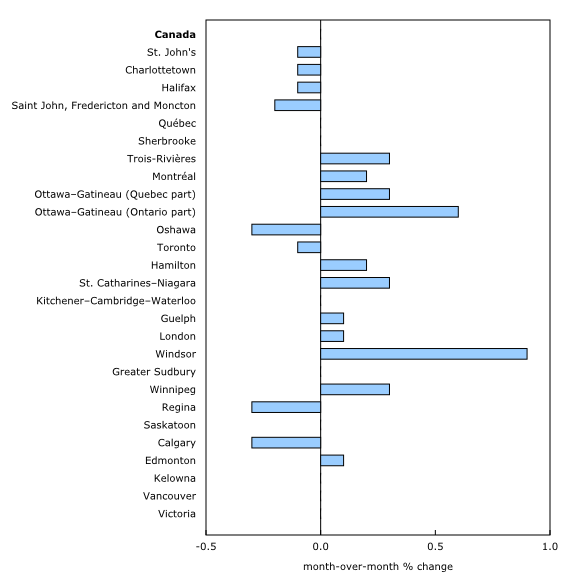 In Ottawa, builders tied the gain to favourable market conditions and higher construction costs. A steady rise in new home prices has recently been observed in both CMAs. Since January of this year, prices have been up every month in Ottawa and have increased 8 out of the 10 months in Windsor. New house prices edged up 0.1% year over year in October, the smallest annual increase since January 2010. For a fifth consecutive month, Ottawa (+4.7%) and London (+3.9%) registered the largest 12-month gains among the surveyed CMAs. Among the eight CMAs reporting 12-month decreases in October, the largest decline was in Regina (-2.4%). On a year-over-year basis, new house prices in the CMAs surveyed in Alberta and Saskatchewan have fallen or remained flat for four consecutive months. Statistics Canada has a new dashboard, Housing Market Indicators. This web application provides access to key housing market indicators for Canada, by province and by census metropolitan area. These indicators are automatically updated with new information from monthly releases, giving users access to the latest data. A data table highlighting changes in new home prices in Canada and select census metropolitan areas is available as part of the Just the Facts series. The New Housing Price Index for November 2018 will be released on January 10, 2019. The dashboard Housing Market Indicators is now available.